Macau is a Special Administrative Region of the People's Republic of China, and, like Hong Kong, benefits from the principle of "one country, two systems". 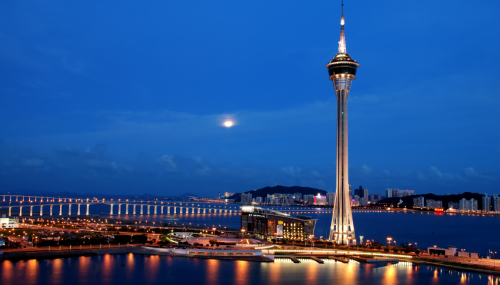 Macau is famous for the blend of Portuguese and Chinese cultures. The tiny SAR is growing in size - with more buildings on reclaimed land - and in the number and diversity of its attractions. The greatest of these continues to be Macau's unique society, with communities from the East and West complementing each other, and the many people who come to visit. Macau has developed in the past industries such as textiles, electronics and toys, while today has built up world class tourism industry with a wide choice of hotels, resorts, MICE facilities, restaurants and casinos. Macau's economy is closely linked to that of Hong Kong and Guangdong Province, in particular the Pearl River Delta region, which qualifies as one of Asia's 'little tigers'. Macau provides financial and banking services, staff training, transport and communications support. Macau debuted in Miss World 1986 and competed every year until 1997. They returned to the pageant in 2010 and this year, Winnie Sin, Miss World Macau 2012, will represent the region in Ordos. The Times of Beauty proudly presents Winnie Sim, Miss World Macau 2012, in an exclusive interview for our interview series, Meet the Misses. Macau is one of the two special administrative regions of China, the other being Hong Kong. Macau was a Portuguese Colony until the handover on 20 December, 1999. My future plan is to firstly complete my law degree (Legal Discipline of Greater China) and at the same I will continue my TV Host job. Then I’d like to have my own boutique and hope one day I can see my boutique not in Macau but also in China. When I won the silver medal in the Synchronized Swimming Category of Asian Swimming Championship in 2009 as a national teammate of Macau, I feel so proud of myself. It’s a true honor to both Macau and myself. 4. If somebody was describing your personality what would they say? 5. What is something you know you do differently than the most other people? I think many people do not quite understand what beauty pageant contestants actually do. Beauty pageant contestants are somehow like athletes, we are not only focusing on our “performance” but also our integrity and discipline etc. I have been doing lots of voluntary works since I was crowned Miss World Macau. Lately, I went to visit a senior home and talked to the people there. I learnt from them that aging gracefully is essentially, life can be still so beautiful and meaningful even we grown old. Definitely latter. I am very adventurous, I rather face the challenge then give a pass, that would make me no regret. I would like to teach people synchronized swimming. It’s such an amazing sport and as being a true athlete is very tough. By going through the training, you may surprise yourself by how far you could go and how tough you could be. positive and to be myself, I believe it’s very important. Hello everyone, am so proud to have such a precious opportunity to represent Macau in this year’s Miss World pageant. And I hope all of you would keep track on us during the pageant and support me and of course other contestants as well. Stay tuned!